Why most of the healthy food products are labeled with a higher price tag? A few weeks ago, the organic food section in Food Bazar just had two shelves which has now increased to five in numbers. The fact clearly suggests the pace with which organic food industry is coming up with more players and products. Recently, Best foods launched the brown rice and organised a seminar highlighting the importance of brown rice. In order to prove the vitality of brown rice, the company showed us a list of diseases to which we are exposed if we do not add brown rice to our diet. It was not long back when Organic India launched a range of products. They spent less time speaking about their products and more naming the chemicals, or, in their language, the harmful chemicals we keep eating as a part of our lives. Not only the chemicals but they warned us about the ‘tension-full cows’ and their milk in order to promote their ‘ghee’. As most of the FMCG players are adding so called ‘healthy food’ to their portfolio, they are apparently spreading a perception that the normal food we eat is nothing but ‘Junk food Part 2’. The organic foods are one major section of the healthy foods. The roots of this segment are actually in the roots of the plants grown by our farmers. The conventional farming techniques use fertilizers, pesticides and herbicides. Inorganic farmers often use antibiotics even though no disease is present, as a preventative; they also use certain antibiotics and hormones which they believe will increase the rate and amount of growth or production. The inorganic farming reduces the fertility of the soil and after the regular use of such pesticides, the land cannot be used for cultivation. Whereas the impact of these pesticides on consumer’s health is still not proved to be adverse. 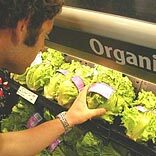 No evidence of a difference in content of nutrients and other substances between organically and conventionally produced crops was detected for the majority of nutrients assessed in this review, suggesting that organically produced crops and conventionally produced crops are broadly comparable in their nutrient content. There is no good evidence that increased dietary intake of the nutrients identified in this review to be present in larger amounts in organically produced crops than in conventionally produced crops, would be of benefit to individuals consuming a normal varied diet, and it is, therefore, unlikely that these differences in nutrient content are relevant to consumer health. Even if the healthy foods are accepted as the better option, the question is: why almost all the health food segment products are two to three times costlier than their counterparts? At the Best Foods’ brown rice launch, Dr Ritika Samaddar explained the importance of manganese and other micro nutrients which are removed during the processing of rice. This is the reason why Best Foods have come up with ‘brown rice’ which involves less processing and has the essential micronutrients intact. Despite the fact that there is less processing required yet the prices are high, Ayushman Gupta, CEO, Best Foods said “We have high end machinery and we take care of each grain during processing so that it does not lose the fibres”. But obviously there are white rice brands which take care of the finishing aspects of processing, involve more processing and are sold at half the price of the launched product. Krishan Gupta, MD and Global CEO, Organic India, in the response to the high pricing of their products said “Organic farming is costlier than the conventional farming and we pay a good margin to our farmers, as a result our products are relatively marked at a higher price”. This may be the case with Organic India but Best Foods procure rice from the wholesale market. Clearly, farmer’s share is not the reason for the high prices in all the cases. Gupta admitted in an interaction with Retailer “The prices are subject to the number of players and this is a way to expand the market. The higher prices will attract the brands to venture into this and eventually the prices can go down significantly. With the number of players as they are now, prices are bound to be as high as they are”. The market is in the phase of being bisected into two parts, healthy food and unhealthy food. As of now, these brands are riding on the insecurities spread about their conventional counterparts. As the market is a lot export oriented and the buyers abroad are rich to shell out more money in the name of health, the products are marked at such high prices. Most of these brands have the export contribution as high as 80 per cent. The healthy organic and green food products are good for the climate, soil and our health. But in a country like India, is it feasible for the common man to eat rice which is Rs 180 per Kg? The question which has to be answered by the key players of the industry is - why is health a prerogative of just the deep pockets? Top 5 logistics challenges faced by e-retailers! How VR is a third Dimension between online and offline? How celebrity brands are becoming a big thing in India?